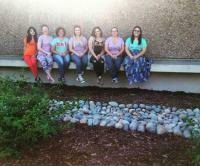 Stanislaus State currently has 10 women's sororities on campus, each with a unique mission and purpose. All 10 organizations are officially chartered with the Student Leadership & Development and are part of one or more of the Greek councils on campus. Additionally, some groups are part of a larger National/International organization. The National Panhellenic Conference (NPC), founded in 1902, is an umbrella organization for 26 inter/national women's fraternities and sororities. 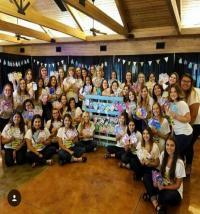 Three of these sororities have chapters on the Stanislaus State campus. 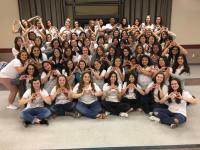 At Stanislaus State, these organizations are part of the Panhellenic Council. This council coordinates a yearly formal recruitment process which is held during the fall semester at Stanislaus State. A women's fraternity dedicated to philanthropy, academics, sisterhood and inspiring women to realize their potential. This organization's purpose is to give service; promote the advancement of womanhood, friendships and cooperation among college women of all races, relations, and creeds; to further the knowledge of its members; and to promote philanthropic endeavors. This organization promotes vibrant living while also encouraging members to achieve their personal best. This is an organization of women musicians who gather to promote music in America and throughout the world. NALFO is an umbrella council for 20 Latino Greek Letter Organizations established in 1998. The purpose of NALFO is to promote and foster positive interfraternal relations, communication and development of all Latino fraternal organizations through mutual respect, leadership, honesty, professionalism and education. 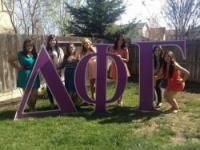 This is a Latina based sorority founded in 1990. Alpha Pi Sigma's mission is to unite and support women to advance academically and professionally. Regional organizations have chapters at various colleges and universities throughout California. Local organizations exist solely at one college or university. These organizations are usually tied to local campus traditions and exist as individual entities not tied to a national/international organization. 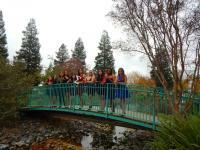 Stanislaus State currently has 5 regional and local sororities. This organizations purpose is to provide a sisterhood of friendship and honesty including community service, socials, leadership skills, and sisterhood events. 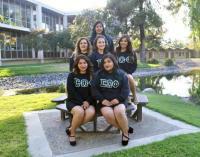 Lambda Sigma Gamma Sorority, Inc. was founded in 1986 and it is the first and largest Multicultural sorority on the West Coast. Our purposes are to instill the desire for self improvement, scholastic excellence and the cultivation of civic responsibility; also to promote unity and higher education amongst women. 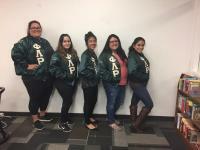 This organization's purpose is to promote academic excellence within its members, provide sisterhood, engage in community service, with emphasis in the Chicano/a and Latino/a culture. Sigma Omega Phi Multicultural Sorority Inc. The purpose of this sorority is to open minds through culture, education and unity. This organization's purpose is to encourage academic excellence and furthering of education; to provide an example of the ideal multicultural sorority; to inform and teach others of the definition of multiculturalism; and to provide and sustain a strong sisterhood throughout a lifetime.